Fusion science, which seeks to recreate the energy of the stars for use on Earth, has long been the holy grail of energy researchers. The discipline has its skeptics, but officials at Livermore Livermore National Laboratory (LLNL) are confident that commercially viable fusion power plants will be possible within the next few decades. Ever since it was founded in the early 1950s, LLNL has been developing methods to unlock the mystery of fusion power. There are two principle techniques: magnetic fusion and inertial confinement fusion (ICF). When the laser was invented in 1960, Livermore scientists glommed onto the idea of using convergent beams of light to ignite a fusion micro-explosion. Researchers at Lawrence Livermore’s National Ignition Facility (NIF) continue to pursue the goal of achieving controlled thermonuclear burn in the laboratory using laser light. 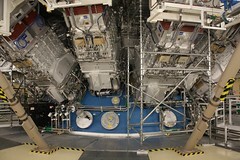 On Aug. 13, 2013, all 192 of the ultra-powerful laser beams at NIF converged on a tiny deuterium-tritium filled capsule. In a matter of nanoseconds, the capsule imploded and released a neutron yield of nearly 3×10^15, or approximately 8,000 joules of neutron energy. It was a record-setting yield, three times higher than previous efforts. ← Priority Based Budgeting and the Start-Up Revolution!